A thief with 250 offences behind came out of jail to find he was a crime victim - and his belongings had been stolen. Ex-drug addict Andrew Leonard's home had been raided while he was serving his third spell behind bars this year. He then went out thieving again after he had spent his £46 prison release grant and had no benefits cash, a court heard. 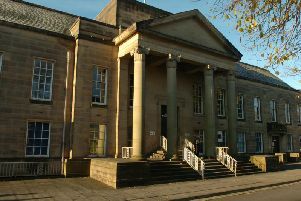 Burnley magistrates were told how the 49-year-old "prolific shoplifter" has 158 previous convictions for stealing. In April, he was sent down for 20 weeks after, the court earlier heard, he wanted to be locked up. Leonard, who won his freedom on June 11, was out stealing within nine days, when he stole seven jars of coffee worth £41.93 from Farmfoods in his home town of Colne. Three days after that, he struck again, this time at the Co op, where he helped himself to a haul of goods to the tune of £78. A previous hearing had been told how the defendant got the 20 -week term in April after he went on a stealing spree. He had taken meat, coffee and clothing worth hundreds of pounds when he targeted the same two stores and also Matalan and Tesco in Colne repeatedly, whilst on licence. He had owned up to 15 offences of theft and one attempted theft. The latest case heard how Leonard has a total of 251 previous offences on his record and was caught because he is such a well-known thief. His solicitor, David Lawson told the court :" Its a long story so far as his record is concerned. It's the same old story." Mr Lawson said the defendant didn't commit the offences to fund a drug habit. He had been released from Preston Prison with the £46 grant on June 11. He found his rented home had been burgled and his belongings taken. The solicitor continued: "That £46 doesn't go a long way and it doesn't go a long way when it takes three -and -a -half weeks to receive your benefits." Magistrates heard Leonard is on post -sentence supervision and was said to be attending his appointments with the probation service. Mr Lawson added: "He has been clean since he went into prison. He has gone of his own volition to Inspire (the drugs treatment service) and is subject to licence supervision until August. He appears to be a man who is determined and motivated to make a change." The defendant, of Cleveland Street, Colne, admitted two counts of theft, on June 20th and 23rd. He was given a 12-month conditional discharge by the justices, who told him: "The Bench does understand your predicament." He must pay £120 compensation.